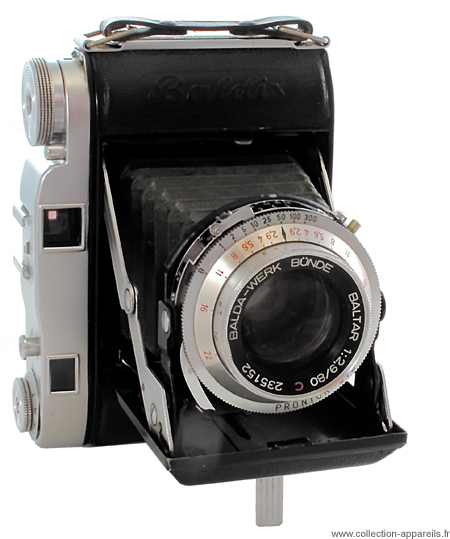 This Balda Baldix , known as Mess - Baldix (or rangefinder Baldix) is a folding 6 x 6 cm not very innovative but well built. In 1954, dedicated to a market of not too demanding amateurs, it perhaps did not give the effect of an obsolete item, but a few years later it will be the case. This does not prevent him from making good pictures in medium format . The integrated rangefinder is not coupled , you must set the distance on the lens after reading the distance indicated under the setting disc on the rangefinder . The progress of the film 120 is controlled by a window on the back of the device, but there is also a counter ( small window on the left side of the unit) which counts the number of times the wheel has moved the film to a next position; mechanism limits the number of revolutions of the wheel. A lever allows for the reset . There is a protection against double exposure . The lens is treated for color (red C on the lens). The device is self erecting by pressing a button on top cover and must be cocked in order to be closed back.